Did you know that Elvis Presley wanted to record Dolly Parton’s song “I Will Always Love You”? It was all set until Elvis’ manager, Colonel Tom Parker, called Dolly to demand 1/2 of any royalties on the song for life. Dolly declined and went on to earn over 20 million dollars on that one song alone. That is just one of the many great stories we heard on the RCA Studio B Tour. If you are a country music lover, then the RCA Studio B Tour is an addition that you will not want to miss when visiting the Country Music Hall of Fame. The tour begins at The Country Music Hall of Fame. Your tour guide will assemble the group and load everyone onto a small tour bus. The RCA Studio is a few miles away. As we traveled, our tour guide, George, pointed out lots of interesting places in the downtown area. There is also a pre-recorded track by Dolly Parton where she tells some funny stories about her days recording at the studio. Once you arrive at the studio, you will enter a foyer area. This area has some great displays of photographs of artist who recorded at RCA Studio B. George, the tour guide spent close to 15 minutes talking about specific songs that were recorded in the studio. This talk was accompanied by music. I really enjoyed this part of the tour but my kids got a little impatient. Unless your child is a die-hard music fan, I would probably not bring them on this tour until they are teens. As you walk toward the studio area, you will be able to see lots of old recording equipment. I have no real interest in this kind of stuff but it is presented in a really interesting way. My kids loved this part of the tour. When you enter the actual studio, you will be able to sit down for the rest of the tour. Our guide played us a recording of “Are You Lonesome Tonight?” that Elvis Presley actually recorded in that very room. There was something kind of magical about the whole experience and I don’t even consider myself to be a huge fan. 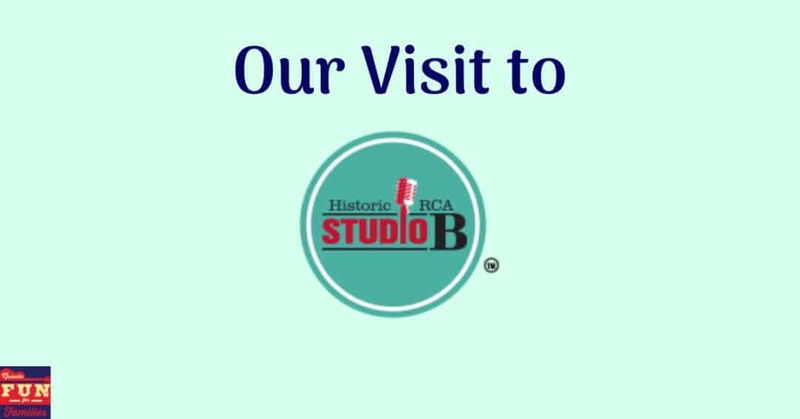 The RCA Studio B Tour will be the highlight of your trip to the Country Music Hall of Fame. Country music lovers will love all the stories and history presented on the tour. Check out our tour of the Country Music Hall of Fame here. Hours : Studio tours depart daily from the Country Music Hall of Fame and are sold only in conjunction with museum admission between 10:30am – 2:30pm. Tickets can be purchased online at this link.